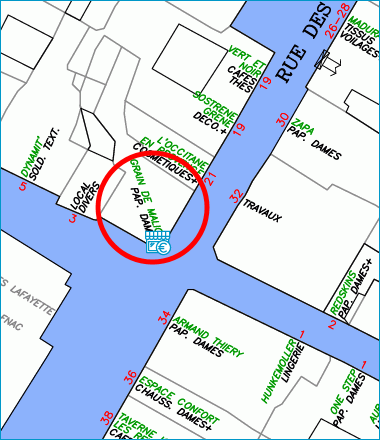 Retail vacancy rates affect all the players of the economic life of our cities and create much anxiety. Without interfering in the ensuing debate and controversies, Codata provides you with the results of its field censuses year after year. Field censuses are carried out annually and are based on the same method for more than 7,000 commercial sites. 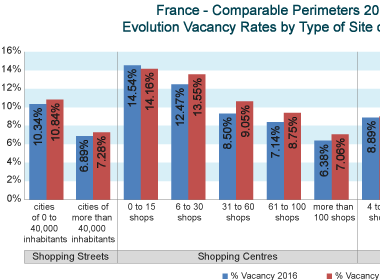 This constant monitoring that was set up nearly 20 years ago allowed to establish that the overall French vacancy rate reached 8.58% in 2017. It increased by 0.40% in comparison with 2016. 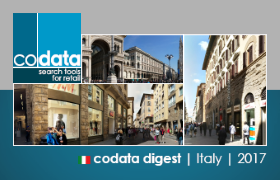 However, there are striking differences between the types of sites: 8.53% in shopping streets, 10.78% in shopping centres and 7.33% in retail areas. A more detailed analysis helps to identify other differences between subcategories. 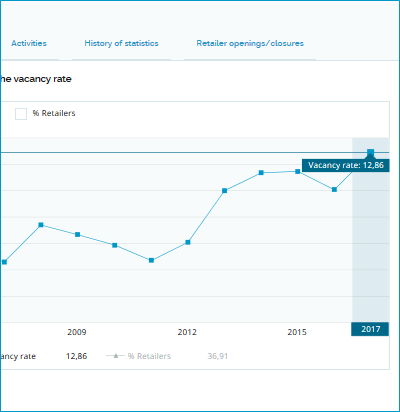 Beyond this first approach, it is interesting to know the evolution of the vacancy rate site by site. 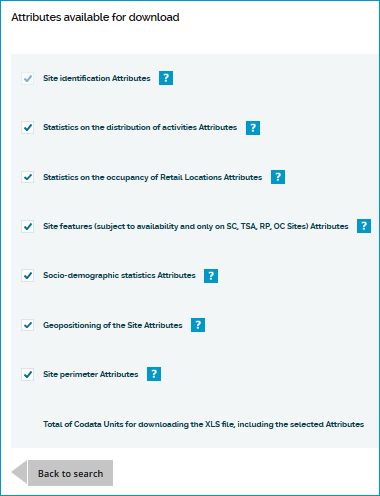 Codata Explorer and its page "Shops Statistics" allow that. 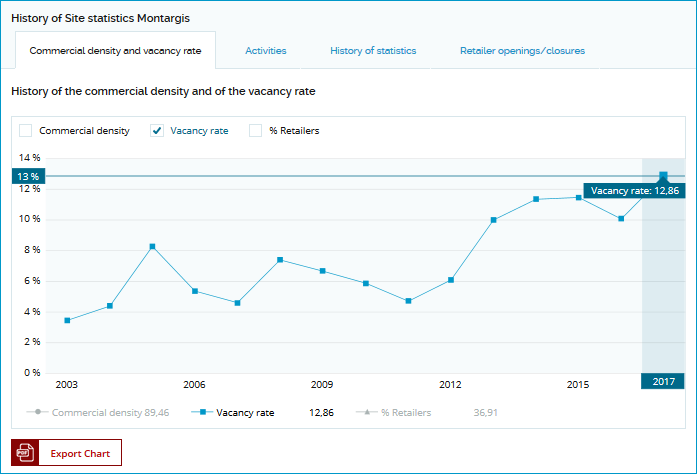 The following chart allows you to notice that the vacancy rate of Montargis’ city centre increased from 3.46% in 2016 to 12.86% in 2017. 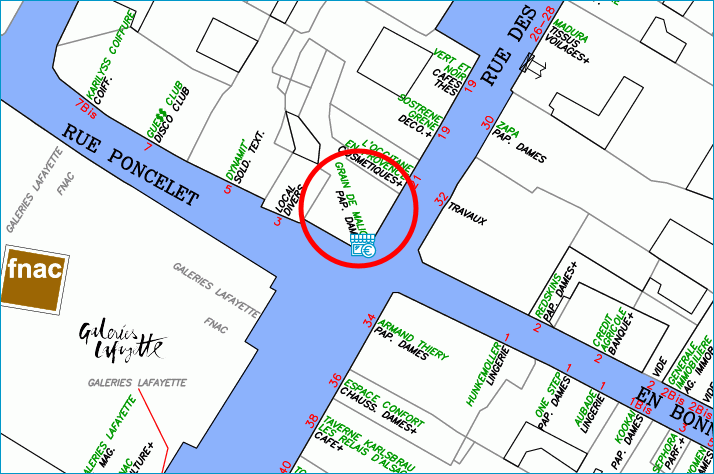 Naturally, the next step is to compare the sites in order to identify high-risk sites as opposed to low-risk sites. Codata Files allows that with its history files over 10 years. 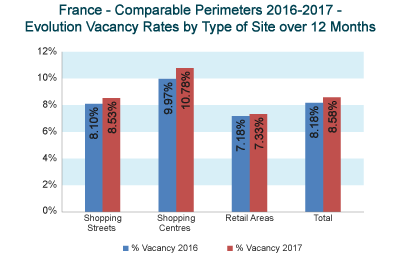 Here are some vacancy rates from this file for the year 2017. 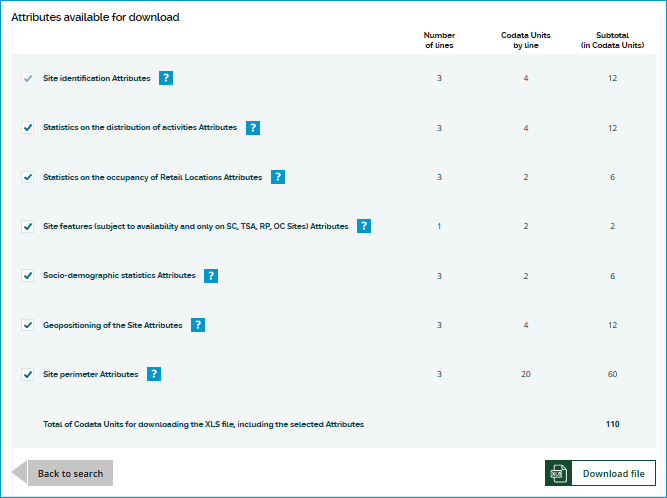 It is worth knowing that these "History" files allow you to define the site by site evolution of the vacancy rates over 10 years and for 10 countries. They also allow you to define the evolution of the different activities and the percentage of Retailers. 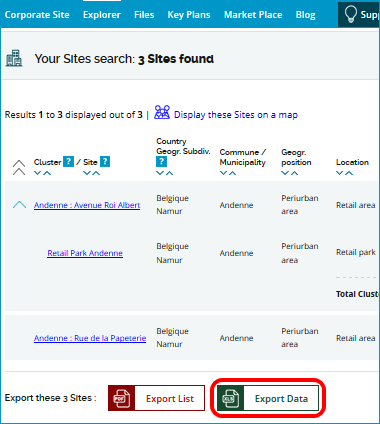 All Codata data can be consulted online via the service Codata Explorer. It is also possible to download all search results in Xls format. A "one-click" solution to get data on sites, locations, retailers or service providers to integrate into your information systems. All Codata data are also available via Codata Files. This service "on request" is particularly recommended for large-size files or for specific requests. Data sets are available by country and can be segmented by type of Site, by geographical area or by activity. They can also correspond to complex requests that meet your needs. 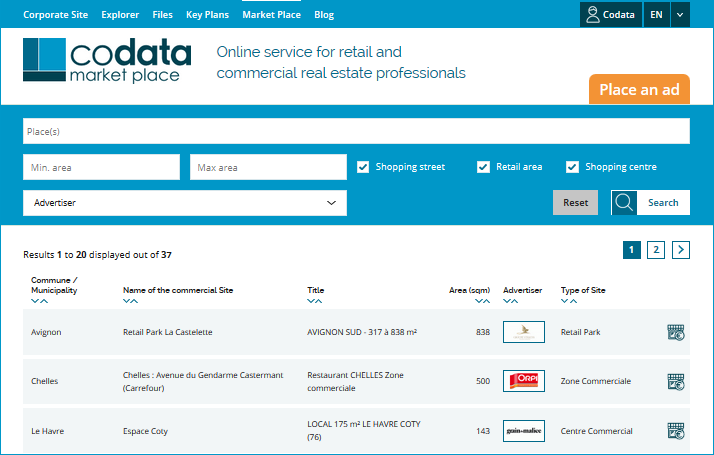 Codata Market Place allows you to advertise free of charge for your available locations. 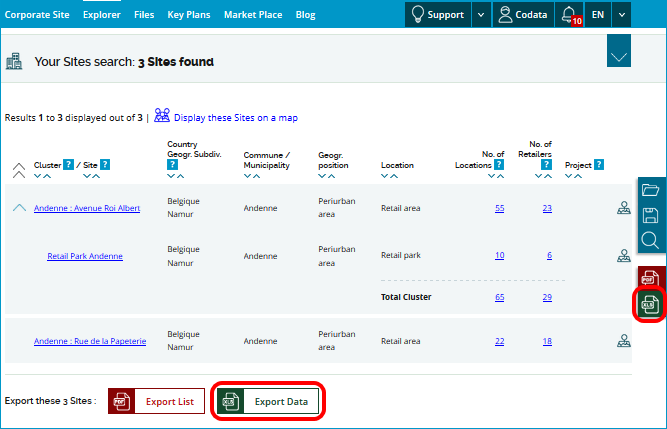 You can also relate them to a Site and even to a listed Location on Codata Explorer. Thus, you can reach a qualified community of real estate professionals. 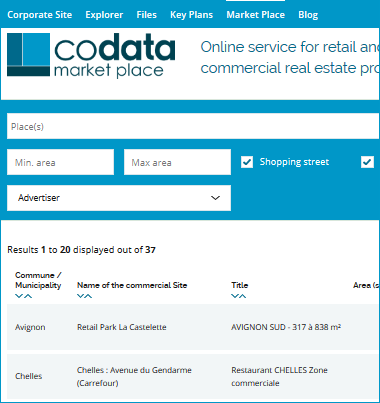 Likewise, the visibility of your good is increased by the presence of a Market Place pictogram that is precisely geolocated on Codata Explorer’s map interface. This Site and Location localisation allows the potential tenants to be quite informed: it saves time and increases quality for everyone. 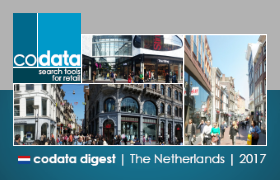 Each Codata Digest edition presents a section about the fastest growing Retailers. 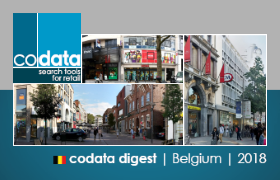 Every year, we make up the list by country of the 50 Retailers that opened the highest number of shops within Codata perimeters. The latest editions on France, Italy, Belgium and the Netherlands show that the "Top 50" are systematically different. The sectors are also extremely varied. However, examining these "Top 50" allows you to identify some Retailers that strongly develop in several countries. Among them, the Retailer Kiko ranks in the "Top 50" France, Italy, Belgium and Netherlands. As for the Retailers Nespresso, Solaris, Pandora, Action, Flying Tiger or Intimissimi, they rank in the "Top 50" of at least two of the four countries. 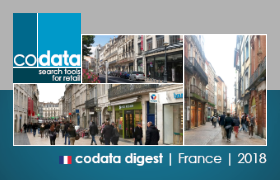 Of course, the identification of all these shops openings is available on Codata Explorer, not only for the Retailers of the Top 50, but also, country by country, for each of the 7,000 listed Retailers in Codata database.